The Rules of Golf and the following Local Rules shall govern all tournament play at the Eaton Canyon Golf Course. OUT OF BOUNDS: is defined by the line between the course-side points at ground level of fence posts surrounding the course, the surrounding maintenance yard; flood control channels (except as otherwise noted in these Local Rules ;) and right edge of cart path on hole #2 from the blue monument tee area to the bridge. SPECIAL IMMOVABLE OBSTRUCTIONS: Protective screen on hole #8. During play of the 8th hole, if the protective fence on the 9th hole is in a player’s line of play: The player may take free relief by dropping a ball in and playing it from the dropping zone which is designated as the 8th hole Junior tees provided this relief is no nearer the hole. (See Rule 14.3). Channel fence bordering the Penalty Area on hole #3. When the protective fence (on either side) interferes with a players stance or swing, in addition to the relief provided under Rule 16.1, a player may, without penalty, take relief by dropping a ball at the 3rd Hole Junior tees. DROPPING ZONES: A ball that is adjacent to boundary fence behind hole #4, if declared unplayable, may be dropped in the designated dropping zone south of the 4th green as an additional option to those under Rule 19 (Tournament Committee Adopted Local Rule). PRACTICE: On holes #1 through #9 practice is not permitted on or near the putting green of a hole previously played. (You will be playing them again on hole #10 through #18). (Tournament Committee Adopted Local Rule). PREFERRED LIES: (1) a ball lying within and erosion rut of a dirt road or path may be lifted without penalty and placed within 6 inches of the edge of the rut where the ball originally lay, but not nearer the hole. The ball may be cleaned when lifted. (2) When the tournament chairman posts the "Winter Rules" sign, a ball lying in the "fairway" of the hole being played may be lifted without penalty and placed within 6 inches of where it originally lay, but not nearer the hole. The ball may be cleaned when lifted. Exception: A ball lying within one club length of a tree, hazard (bunker or water hazard), boundary fence or other object defining out of bound is deemed not to be lying in the "fairway". NOTE: Preferred Lies may be modified for a specific event at the discretion of the tournament chairman. Revised by Board of Directors, February 1993. 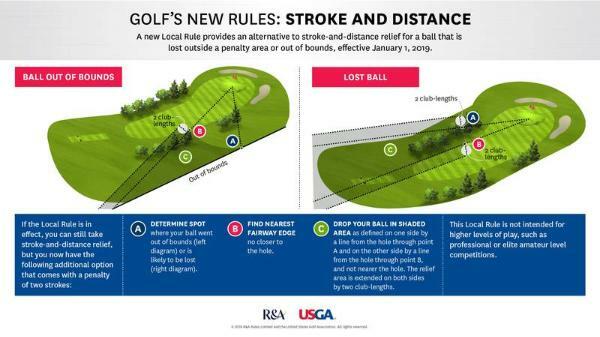 ALTERNATE TO STROKE AND DISTANCE LOCAL RULE: (Board of Directors Adopted Local Rule January 2019). This Rule is not in effect for the Club Championship nor the Senior Club Championship. · Last crossed the edge of the course boundary to go out of bounds. b. Fairway Reference Point: The point of fairway of the hole being played that is nearest to the ball reference point, but is not nearer the hole than the ball reference point. For purposes of this Local Rule, “fairway” means any area of grass in the general area that is cut to fairway height or less. If a ball is estimated to be lost on the course or last crossed the edge of the course boundary short of the fairway, the fairway reference point may be a grass path or a teeing ground for the hole being played cut to fairway height or less.